Every week... no I can’t commit to that, every now and then I’m going to write about a match that’s stayed with me for some reason. Maybe it was a great game, maybe it was the worst I’d seen, maybe it had a memorable moment, maybe it was Ireland nearly losing to Georgia in the World Cup. A Classic or a ‘Classic’. Either way I’ll bring up a game that’s been stuck in my mind since I first saw it. While I’m at it I’ll try to make it topical, and with the Rugby Championship to be decided this weekend between Australia and New Zealand, I want to take us back four years to a similar situation. It was the last edition of the Pre-Puma tournament, the Tri Nations. New Zealand and Australia could both win the tournament on the final day; it was all to be decided at the Suncorp Stadium in Brisbane. New Zealand went in as favourites, having won the earlier meeting between the sides by 30 points to 14. Australia took the lead early on and had all the momentum in the first half, and Quade Cooper was instrumental. He kicked an early penalty and pulled off an incredible pass, flicking the pall out beside him despite having Richie McCaw wrapped around him. Will Genia was his usual electric self in getting the first try, quickly dodging the All-Black defence from 5 meters out. Cooper converted it and added a penalty, and the Wallabies had a 13-3 lead. And now for the reason I remember this game. Radike Samo. The number 8 was making his first international test start since 2004, and at 35-years and 49 days old on the day, he is still the oldest Australian to play a Tri Nations test. When he got the ball inside his own half it seemed like he would make a few meters before Adam Thomson would take him down, resulting in the ball being recycled and a normal phase of possession. But Samos right hand had other ideas. After despatching of the lock, he did a 60 meter sprint with ease. He showed unbelievable pace for a man his age, and impressive pace for a man his size too. Not for a step of that run did it seem in any doubt he was going to score that try. It was a moment that gave Australia a big lead, and a big chance of winning the tournament. It was a try that goes a long way to describing Southern Hemisphere rugby, pure and utter pace. Australia lead 20-3 at half time, but it’s important to remember that no matter how far New Zealand may be behind, they are still New Zealand. Dan Carter had an impeccable place kicking performance and kept the All Blacks in the game. They did not panic and remained patient. After 27 phases Conrad Smith crossed over the line for their first try of the game. 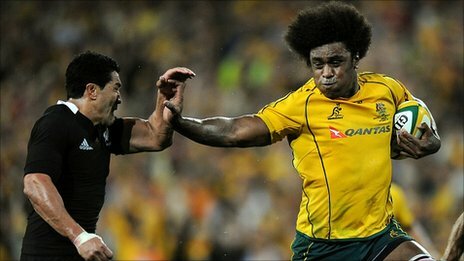 Shortly after Ma’a Nonu skilfully skipped past the Australian defence to touch down. Carter converted, New Zealand were level, and it really seemed like it was going to be one of those days. World Class teams can switch it on and muscle their way back into a game after being on the back foot for large parts, and New Zealand are a world class team. But then Australia did something else world class teams can do, turn the tide out of nowhere, and they did it just one minute after New Zealand had drawn level. It was a sucker punch of a try, in that it happened quick and against the run of play. Will Genia broke through the line and gave it to Ioane Digby who beat the remaining New Zealanders before chucking the ball to Kurtley Beale to dive over. Australia had regained their lead at the hour mark, erasing New Zealand’s comeback in the third-quarter of the game. Cooper missed the wide conversion though to keep the tension high. The match was scoreless for the final twenty minutes, but it by no means lacked excitement. Flair attacks were met with stubborn well-disciplined defence. In the end Australia had won it by scoring at key stages in the game. They got a try early on, and incredibly one nearing half-time, and again when New Zealand were having it all their own way. Australia won their third Tri Nations, and their first in ten years. For the first time since 2009, New Zealand had lost two games back to back, having been beaten by South Africa in their previous match. However, they didn’t do too badly that year, winning the World Cup for the second time in front of their home fans, beating Australia along the way. The Rugby Championship is tight at the top going into the final round. Australia and New Zealand are level on points with a similar point differential. They’ll meet again in the second Bledisloe Cup game next weekend. It looks like we might see a similar exciting game to the one four years ago, but we wont see that Radike Samo try again, that was one of a kind.